Ten-year-old Nicholaus is a whirlwind of energy and – thank goodness – he likes to direct that energy to helping out around the house. Nicholaus liked caring for all the animals in the household – and there were quite a few. Does he have a favorite? “I like the tortoise because it’s so small and cute,” he says. Nicholaus also likes much bigger animals – horses. During a recent visit to Tyler Farms AZ in Mesa, riding instructor Scott Tyler and Nicholaus brushed the horses before mounting up for a lesson. “The horse was so calm,” Nicholaus says, adding that he enjoyed getting the horse to trot. Nicholaus also has a keen interest in all things mechanical and says he hopes his forever family has dirt bikes in the garage. 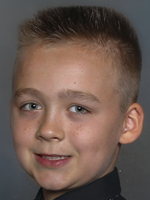 Nicholaus hopes for a forever family that includes a mother and a father. He would do well with an active family that offers a strong male role model....and lots of animals. For more information about Nicholaus, please contact John Hicks at (602) 930-4465 or via e-mail at jhicks@aask-az.org.